Check the battery, lights, antifreeze, heater/defroster, belts, hoses, filters, oil, wipers and brakes. Carry the basics-an ice scraper, a snowbrush, a small shovel, tow chains and jumper cables-in your car. Also add a breakdown-kit that includes a blanket, gloves, boots, warm clothes, a flashlight, food, water, a first aid kit, extra batteries, road flares and emergency cash to your supplies. 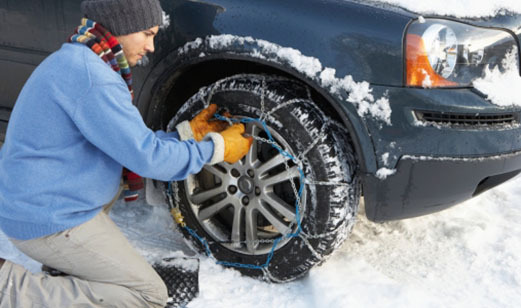 Add chains to your tires if necessary. It’s also important to know what’s true and what’s false when it comes to safe driving in bad weather. For example, did you know that using cruise control during rainy or icy conditions does more harm than good? Keep your gas tank at least half full to avoid a gas line freeze-up. Press the gas pedal slowly when accelerating to regain traction and avoid skids. Take your time breaking for a stoplight-it takes longer to slow down on icy roads. Don’t apply extra gas on snow-covered roads-for instance when going up a hill-it will just make your wheels spin. safe driving tips, winter car maintenance tips, winter driving, winter driving safety. Bookmark.